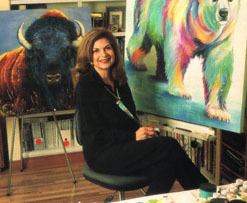 Maria Ryan is an accomplished artist and designer who has been winning awards and pleasing collectors around the world for the past thirty years for her paintings and designs of all types of wildlife and its habitat. Her paintings have consistently received accolades of the highest order. Her work has been exhibited in The Indianapolis Museum of Art , The Tampa Museum of Art and the Booth Western Art Museum in Cartersville, GA. She has received top show honors in many national and regional shows in the United States and Europe. She was selected into the Top 100 and Top 200 two consecutive years in the prestigious Art for the Parks National competition in Jackson, Wyoming.